10% off on full board rates by making prepayment of the full board amount. In case of modification, cancellation or no show the entire prepaid amount is not refundable and will be retained as a penalty. One child up to 10 years old, sharing the room with two adults free of charge. The Olivieri family welcomes you to the Parco dei Principi Hotel in Giulianova, Abruzzi. 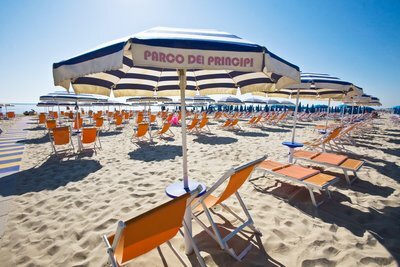 Four-star hotel, located approximately 1000 metres from centre of Giulianova, right on the sea-front. With us the real Prince and Princesses are the children, discover all our exclusive services dedicated to children, including the Kids Menu, the Mini Club for children aged 4 to 12 and the Junior Club for children aged 12 and over. In addition to all children, upon arrival at the hotel, a nice gift offered by the Management will be offered. DISCOVER ALL OUR SERVICES DEDICATED TO CHILDREN. 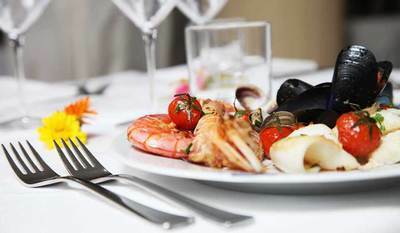 At the our restaurant you will find an authentic gastronomic experience with a menu that combines fish and meat, international and regional dishes, all surrounded by a professional and refined service. We believe that your pets are companions of life and for this they should not miss the experience of family holiday.